Trying to plan out your menu for Father’s Day? This next recipe isn’t exactly on everyone’s diet, but hey – everything’s okay in moderation… right?! Prepare these hot sandwiches with corned beef or pastrami and serve alongside a big bowl of homemade baked potato soup – fully loaded for dad, of course. These sandwiches are super filling so prepare to have leftovers, and for best results reheat in oven or toaster oven so they don’t get soggy. OR you can always eat it with the a fork the next day if you have to use a microwave. Stay tuned to our Facebook page for information about our Father’s Day contest and how you can WIN a goodie package full of delicious hormone-free Passanante’s Home Food Service meats! Take your loaf apart in sandwich pairs and lay them out. In a skillet melt the butter and toss the onions until clear. Add about 3 tablespoons of mustard. 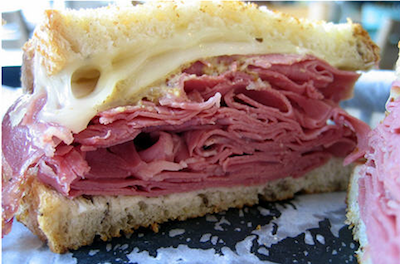 Load both pieces of bread with cheese and corned beef or pastrami. On one piece, spread the onion mixture with the horseradish sauce, and finally layer on sauerkraut and “close” the sandwich together. Layering the sandwich with the wet ingredients in the middle will keep it from getting soggy. Optional: Lightly brush a little melted butter over the tops of the sandwiches for added crispiness. Place sandwiches in baking pans and bake at 400 degrees until cheese melts and bread begins to turn golden brown. Serve with homemade baked potato soup and enjoy. This entry was posted in Beef, Recipes and tagged Corned Beef Sandwich, Food Delivery Service, Hormone-Free Meat, Hot Pastrami Sandwich, Passanante's Home Food Service, Recipe by Passanante's Home Food Service. Bookmark the permalink.